This Vegan Yogurt Starter consists of a blend of lactic acid bacteria specifically selected for use in making dairy-free yogurt. 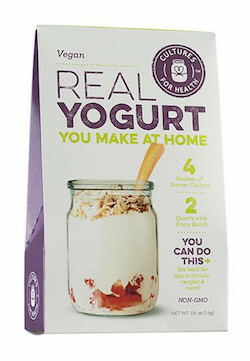 This direct-set vegan culture has a mild yogurt flavor with a smooth texture and slightly weak viscosity. Ingredients: Rice maltodextrin, live active bacteria (Bifidobacterium bifidum, Lactobacillus acidophilus, Lactobacillus casei, Lactobacillus delbrueckii subsp bulgaricus, Lactobacillus rhamnosus, Streptococcus thermophilus). May contain trace amounts of gluten: Barley source is used as a fermentation nutrient. May contain trace amounts of soy: Soybeans are used as a fermentation nutrient. Non-GMO. This culture often requires a thickener to achieve a store-bought yogurt consistency.